The rusted IT soles need to grease themselves oftenly. But the time they don’t have, its very expensive then salary. After a gap of nearly a year team made there mind to come out of this and have to relax for a day. As usual I said it would be into the nature and not the artificial resorts. 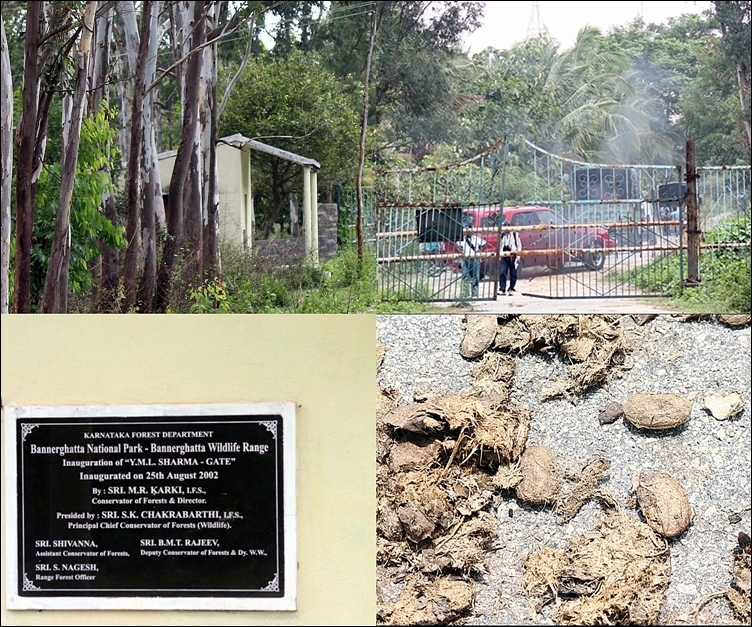 First planned around Bangalore and finalized to IrpuFalls, Bayalkuppe Tibetian settlement and Dubare Elephant Camp near Kushalnagar, Coorg. It was not a easy task to complete in a day 13 hrs of total journey and relaxation without any tension. Confirmed the day visit availability with Jungle Lodges and Resorts and booked. This is our second JLR place with team. Earlier to Bheemeshwari which had a very good experience with them there was no second taught to think about JLR. 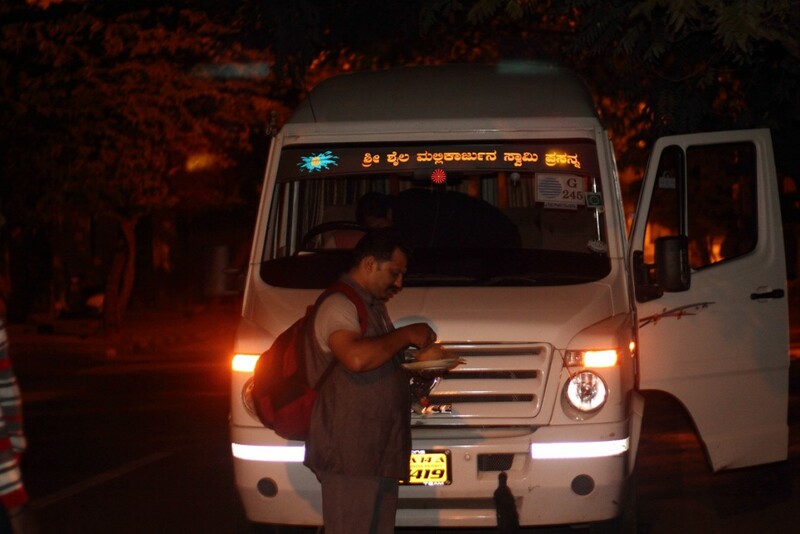 As planned left Bangalore by 3.45 the last pickup and reached Hunsur via Mysore by 6.30 AM. As per the plan to Irpu falls, shocked to see the sign board stating still 78 kms via Nagarahole at Hunsur. 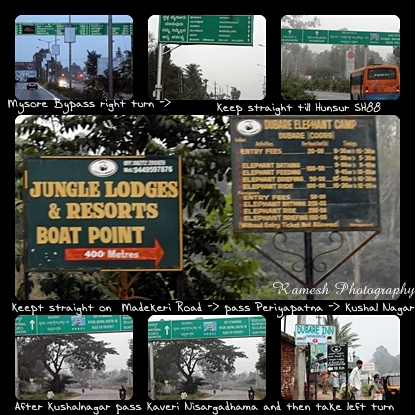 Board sign showing left side to JLR Kabini and straight to JLR Dubare 61 Km. So falls plan was dropped and proceed towards Bayalukuppe. We had a very nice breakfast at Nehru Café at Hunsur. Spent an hour at Bayalukuppe Tibetian settlement which houses a Buddhist montisary an golden temple. Very well maintained by them and a calm place to meditate inside the hall. Its a worth place to visit and experience their from nearby. 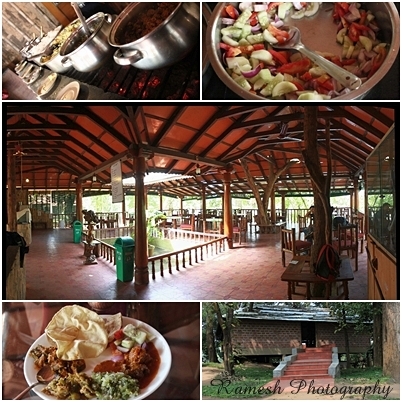 It was already past 9 and I had recived the call from Jungle Lodges and Resorts and enquired where we were. Because by 9 we should be in JLR to complete the day activities. Finally a 45 minutes drive from Bayalukuppe via Kushalnagar reaced the JLR Dubare. The beauty of the place is you have to cross the Cauvery river to go JLR. 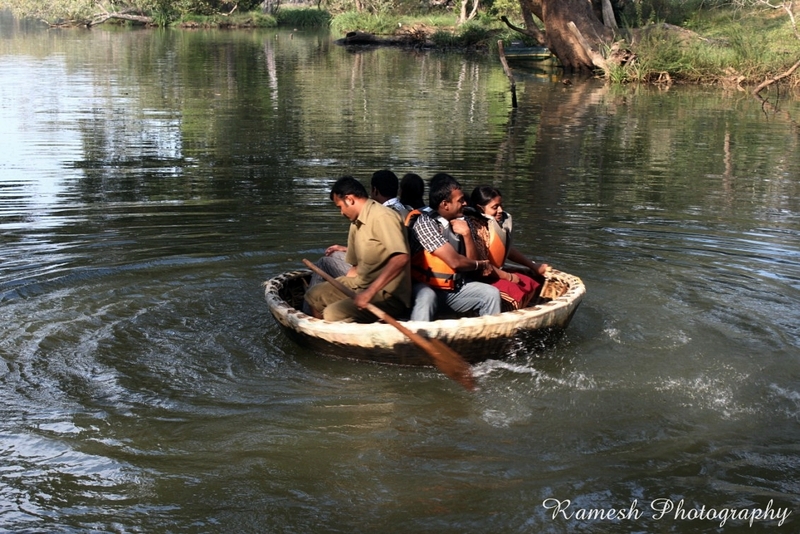 A shuttle boat will ply regularly to pickup the guests. As soon we enter the JLR they introduced Mr. Nagendra Naturalist as our coordinator for the day. He informed before 9 we should be here to see the elephants bathing. To our luck in the misty morning 3 elephants were late to have the bath and we were lucky enough to touch, bath the elephants. It’s a wonderful experience because hearing the elephant name itself one will become nervous but in Dubare it’s another face. You are free to interact with these trained elephants to touch and see there activity from the very near distance. Children’s are most benefited from this as they will enjoy and get out of fearless seeing this giant animal. There are around 30 + elephants in this camp. 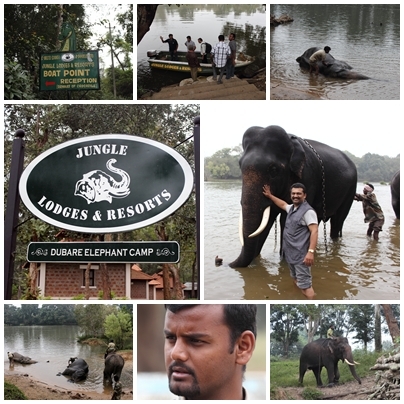 The day Intenary at Jungle Lodges and Resorts – Dubare. Elephant bathing at Cauvery river and you can touch and feel the elephants. Intraction with elephants. Naturalist will explain the elephants of Dubare, there beheviour and nature. Feeding to elephants and food preparation to elephants can be see here. Naturalist will take a nature walk inside the forest. After the elephant bath we are taken to feeding area and Nagendra explained briefly about the Dubare Elephant camp, there behavior and nature, Found few elephants in the feeding area and many already onto work. A herd of elephants with calf seen bringing the wooden logs holding in its trunk to there kitchen. We had a brief photo session with elephants. Then we had an elephant ride and I felt very sorry for having a ride on elephant. Some where I feel it’s also a human cruelty on animals. This ride to be restricted to children’s below 10 only. 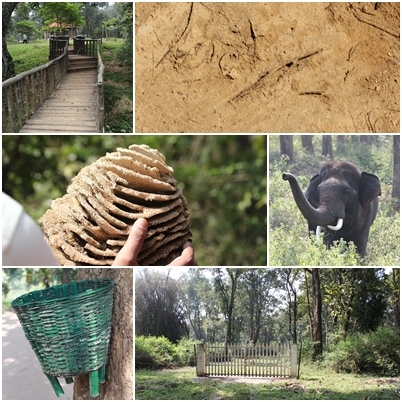 Seeing the elephant in its natural habitat and in camps there are lots of difference. The long hobbles around the legs, bodies, mahout sitting on it, controlling the elephant by hook… Very sorry. He has a very good knowledge on the nature. We had a good walk and took a group shot on the banks of Cauvery. At this time a big Rat snake passed inside the river. Also we saw an elephant enjoying its freedom. By the end of trial belly’s already demanding the refill. Dining hall interior is very beautiful. It had a malnd famous ‘Thotti Mane’ kind look. Rain water flows from all the four side of the roof and falls in the center. That’s why called ‘Thotti Mane”. For heating the food they burn the charcoal inside the cement channels on top steel grills. This gives a continues heat and mad food more tasty. And food is awesome. I thanked the cook Gopi for the delicious food. Finally the day came to end and last program Coracle Ride. Two batches they took the ride. Then the same boat took to another bank and say adieu to Dubare. We spend some time in the river and left forBangalore. On the way we had dinner and reachedBangaloreby 11.30 PM. How to reach Dubare JLR. 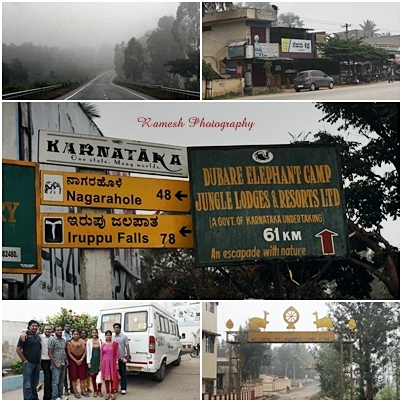 Bangalore to Mysore 150 km (By pass ) – keep straight on Madakeri (coorg) SH 88 Road – Pass Hunsur – > Periyapattna – Kushala Nagar – towards Madakeri after Kushalanagar some 6 kms after Kaveri Nisarga Dhama take left deviation 10 kms to reach Dubare. Total around 265 KM from Bangalore.